With the GlobalGuard app you can now have remote access to the GlobalGuard alarm system from your smartphone. You can set your alarm system to Arm/Disarm, watch live view of the camera in your home and even receive an alert on your smartphone when an event occurs. -Arm/Disarm the alarm system remotely. Simply log in with your Home ID, user ID and password to start controlling your GlobalGuard alarm system. 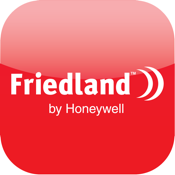 Friedland TM is a trademark of Honeywell Inc.